Brick-and-mortar food retailers around the world have no time to rest on their laurels. No time, because everyone knows that in the mid to long term, e-commerce will not forego the largest consumer sector— food. The development of e-commerce behemoths has been especially swift. Companies such as Amazon, Alibaba, JD, and eBay see themselves as "customer information-based" companies, and their foothold and development in the apparel, electronics, and leisure industries has been massive, edging out companies such as Macy's, Toys-R-Us, Rockport, Nine West, and Sears. Fortunately for the brick-and-mortar retailers, their industry has rather more substantial entry barriers. The nature of the products and the complex logistics involved have held e-commerce retailers at bay. For the past ten years, these e-commerce giants have tried to conquer the industry with the same methods that have been successful in the electronics and leisure industries— and failed. They learned that in contrast to other industries, to win in the food market, a solid infrastructure of brick-and-mortar stores is necessary. In the past two years, we have seen a major change of direction, with Amazon acquiring Whole Foods and Alibaba acquiring and expanding the Hema chain. The e-commerce players have realized that where food is concerned, an online platform simply is not enough— you need to own physical assets. Today, the global food retail industry is undergoing major changes. Terms such as big data, disruption, and digital transformation are finally entering the world's oldest consumption sector. Food retail has a few special characteristics, but most important is the fact that it is the largest consumption sector, accounting for more than 50% of the total retail industry. Consumer spending on apparel, electronics and tourism combined do not make up the size of the food sector. A second unique characteristic of the food retail sector is its close relationship with the customer. 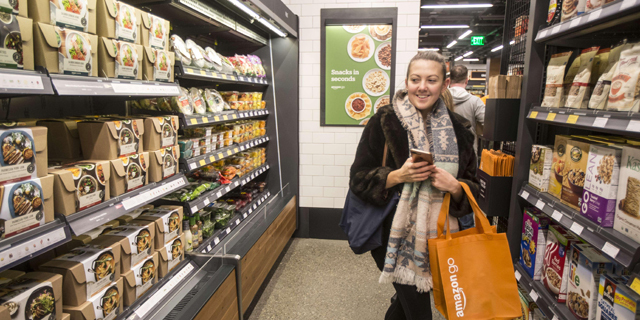 Food retailers meet their customers each week across a range of interfaces, where the customer buys an weekly average of 120 different products. The customers purchase frequency and product selection reveals a great deal about their character and preferences. This type of relationship is unparalleled in any platform or industry. Over the years, the food retail industry has done an excellent job of encoding information obtained from their checkout counters and membership clubs. Some have established grocery shopping sites to expand their reach and data usage. However, use of this data has been limited and "analog" by nature, having little impact on retailers' performance. To date, the most important long-term strategy of food retailers has been to create a logistical edge and set up a technological infrastructure to allow them to take advantage of the vast amount of data they have accumulated. Food retailers have had time to protect themselves against the expansion of e-commerce giants and even target non-food sectors themselves. In recent years, several technological changes have matured in the e-commerce industry, giving food retailers room to use their data productively. The integration of marketing automation systems and the establishment of big data units provided the basics. The combination of information from the companies' ongoing business operations—managing product lines, discounts and promotions, customer interfaces, and the expansion of e-commerce sites to non-food items—can take the data usage to the next level and actualize the substantial potential with respect to ongoing management and customer relationships. Another advantage, which is even more important than realizing business potential, lies in the evolution of food retailers' organizational DNA. The new generation of employees has diverse specializations: industrial and management engineers, data scientists, SEO personnel, as well as UX and UI experts. To a great extent, they enable food retailers to put up a good fight against the e-commerce companies that are trying to invade the food space, and are even helping break open the barriers of expansion into non-food segments. At Shufersal, we have also embarked on this journey. In the past two years, the organization has invested heavily in growing its technological and organizational infrastructure. In the past six months, the main systems we developed have matured and we are fully immersed in the process. The vision by which we can offer our customers any product or service, on any platform, with an experience personalized especially for them, is materializing. The organization is evolving, implementing insights from the data accumulated in the most basic work processes, and is ready to storm ahead and into new domains. Uri Kilstein is the vice president of commerce and marketing at Shufersal Ltd., Israel's biggest supermarket chain.